Chad Ruston joined the Regional Partnership as Vice President of Business Development in October 2017. In this role, he is responsible for attracting new businesses to Northeast Indiana. Chad leads the development and execution of the overall business development strategy to maximize lead generation for the region and contribute to the organizational strategic planning process. 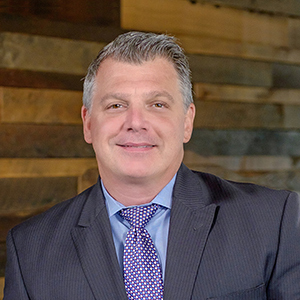 He joins the Regional Partnership with direct experience in business development, most recently with Hollister Incorporated where he led a team of nearly 60 people focused on sales and marketing. Chad holds a Bachelor's degree in both Finance and Japanese from Indiana University Bloomington. Chad also studied abroad at Nanzan University in Japan. While living in Japan, Chad climbed Mt. Fuji and often recalls the old Japanese proverb, “He who climbs Mt. Fuji once is a wise man; he who climbs twice is a fool." Chad and his wife, Cambi, have two kids, 12-year-old Stellan and 9-year-old Hensley. He is an avid road cyclist and participated in the Little 500 while attending Indiana University. Chad is a born Hoosier and grew up in Evansville. However, he spent about five years living and working in Japan.